James Hillier Blount (born 22 February 1974), better known by his stage name James Blunt, is an English singer-songwriter and musician, and former army officer, whose debut album, Back to Bedlam and single releases, including "You're Beautiful" and "Goodbye My Lover", brought him to fame in 2005. 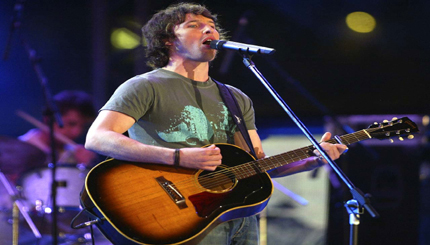 His repertoire can be best described as a mix of acoustic-tinged pop, rock and folk. After recording on the independent American label Custard Records, Blunt won two BRIT Awards, two Ivor Novello Awards, and by 2006 was nominated for five Grammy Awards. The following year, he released his second album All the Lost Souls (2007). Blunt's third studio album, Some Kind of Trouble, was released in November 2010. Blunt was an officer in the Life Guards, a Cavalry regiment of the British Army, and served under NATO in Kosovo during the conflict there in 1999. While posted to Kosovo, Blunt was introduced to the work of Médecins Sans Frontières (MSF or "Doctors Without Borders"). Since then, Blunt has supported MSF by holding meet-and-greet auctions at many of his concerts. As of 4 October 2009 Blunt's primary residence is on the Spanish island of Ibiza.